Lighting is used to match the musical styles during the night. The evening becomes a performance where lighting is used to engage the crowd into your celebration! 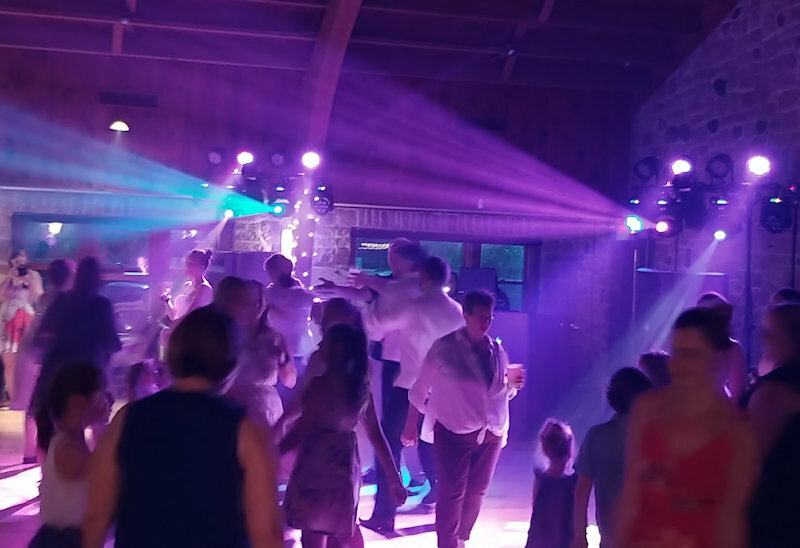 Our shows use concert lighting and unique choreographed programming to engage you into the music with your entertainers. Classy and elegant, but theatrical. Many photographers use our lighting for phenomenal shots, and have complemented us over the years (some of those pics are on this website!). We know we are not hired for our lighting, but it is a valuable "tool" in our bag of tricks. Compare how we use our lighting, side by side, to any DJ. Then you'll know why we do what we do. We want to enhance the evening's mood. The lighting is dynamic and intelligent, which adds to the atmosphere. Then it is choreographed based on music styles you've selected. It adds a dimension to the evening that most DJs ignore. We agree it's about the "experience" we deliver, and how we entertain your crowd, but the lighting takes it a step further. Consider this... would you go see your favorite band to hear your favorite songs with a couple of spotlights blinking? Most likely it would kill the mood and excitement that is important at a wedding. Without it, the celebration is... well... just somebody playing music. We admit, we are very visual, and we want to absorb your crowd into the music. We don't use simple blinking or colored lights that do the same thing over and over. Our lighting choreography creates impact beyond the Emcee work. Sometime it is not lighting at all... it might be darkness... other times, it may be a pure flooding of white light! Combine the "right" music with polished MC's, crowd involvement, and entertainment... then add the lighting. Together, the concept delivers excitement for a evening beyond the DJ norm.! "What can I say? You Rock. Thanks to you, our family and guests were entertained with one of the greatest parties we ever attended. Your professionalism will always be appreciated." "Joe and his team were simply wonderful! They provide an amazing show and kept people at our reception even during a blizzard!!! I would recommend them to any couple tying the not or for any party! Awesome Job!" "Great Job SDDJ!!! Our dance floor should've been bigger because it was packed all night!!! Very satisfied!"